Gallery / Saga Press, 9781481442237, 320pp. A gorgeous fantasy in the spirit of Pan’s Labyrinth “that will appeal to those who loved Neil Gaiman’s The Ocean at the End of the Lane and John Connolly’s The Book of Lost Things” (Library Journal, starred review). Frederic S. Durbin is a writer and novelist of fantasy and horror. His first novel, Dragonfly, was published by Arkham House in 1999. It was nominated for an International Horror Guild Award for Best First Novel. * "This gentle, engaging, and very personal coming-of-age story is mythic in its universality." 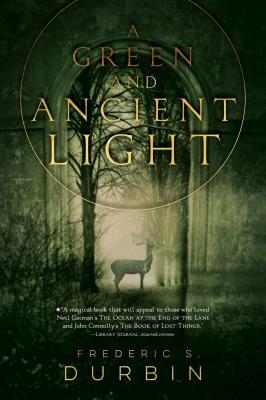 "A Green and Ancient Light combines beautiful writing, romance, war, mystery, and faery fantasy into one compelling, delightful story suitable for grownup or not so grownup readers alike." * "Durbin gives his story an old-fashioned fairy-tale feel...and imbues his settings with a languorous sense of being outside of time. This is a magical book that will appeal to those who loved Neil Gaiman’s The Ocean at the End of the Lane and John Connolly’s The Book of Lost Things." "Durbin’s gorgeously atmospheric novel solidly shares the fantasy-and historical-fiction genres...a delicate dance between reality and fantasy, ominous soldiers and late-night fairy music. Fans of John Connolly’s The Book of Lost Things will enjoy this bittersweet fantasy with a mystery at its core." "This is a lush and wonderful tale of discovery, relationships and mystery that is perfect for young adults or any grown-up who remembers what it was like to learn that not everything is always as it seems....If you like being pulled into a story, enjoy characters that spring off the page and revel in a tale that makes you ache for more, A Green and Ancient Light will certainly shine for you. On a scale of five stars, give this a five, brightly." "Not unlike reading your first beloved book as a child...Durbin’s tale of childhood, family, truth, and bravery certainly captured a piece of [my heart]." "The same magic flows in its veins as does in those of the classic The Last Unicorn or, more recently, Neil Gaiman’s The Ocean at the End of the Lane...I left a piece of my heart with A Green and Ancient Light."